More than 24 hours later, the massive fire is still smoldering near Casselton, N.D. 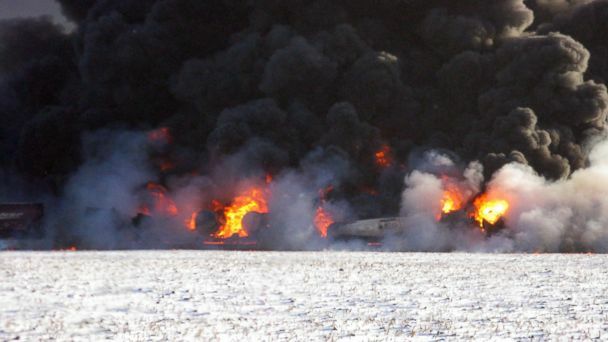 The flames began after a grain train derailed, striking a mile-long train hauling crude oil. With toxic, dark plumes hovering, authorities took no chances and urged residents of the town of 2,400 to get out. The evacuation order was lifted late Tuesday afternoon and residents have started to return home. There were no causalities, but this was the third explosion in the past six months involving trains carrying crude oil from North Dakota. In November, a 90-car train derailed in Alabama and a derailment in Quebec last July killed 47 people. Casselton's mayor believes the string of accidents has raised many questions. "With that traffic, in my mind, is not a matter of if, it's when," Mayor Ed McConnell said. As recently as 2008, 9,500 rail cars moved crude oil across the U.S, Tyson Slocum, the director of the Public Citizen's Energy Program, told ABC News. By 2012, it was 230,000 rail cars. The Federal Railroad Administration is investigating whether this particular crude oil is more volatile. Environmental activists also question the condition of the cars used to transport oil. "When you are looking at this kind of massive increase in shipments of flammable substances like crude oil by rail cars on railroad systems that are outdated and unsafe, it is a recipe for disaster," Slocum said. "We're lucky that we've only seen three accidents in North America this year. There could have been a lot more." This derailment investigation could lead to changes in how North Dakota crude oil is handled and transported. "Moving huge amounts of flammable crude oil on out of date, unsafe rail cars is a recipe for disaster," Slocum said.